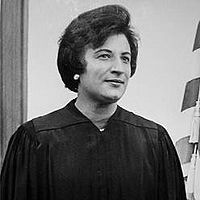 September 28, 2005 Constance Baker Motley, civil rights activist, lawyer and judge, died. Motley was born September 14, 1921 in New Haven, Connecticut. She earned her Bachelor of Arts degree from New York University in 1943 and her law degree from Columbia Law School in 1946. She began her career as a law clerk at the NAACP Legal Defense Fund, eventually becoming associate counsel and the LDF’s first female attorney. In 1950, she wrote the original complaint in the case of Brown v. Board of Education. In 1962, Motley became the first African American woman to argue a case before the United States Supreme Court in Meredith v. Fair. She was successful in winning James Meredith’s case to be the first African American student admitted to the University of Mississippi. Motley was successful in nine out of ten cases that she argued before the U. S. Supreme Court. She had a succession of firsts for an African American woman, including in 1964 being the first elected to the New York State Senate, in 1965 the first chosen Manhattan Borough President, and in 1966 the first appointed a federal court judge. In 1993, Motley was inducted into the National Women’s Hall of Fame. In 2001, President William Clinton awarded her the Presidential Citizens Medal, the second highest civilian award in the United States, and in 2003 the NAACP awarded her the Spingarn Medal.